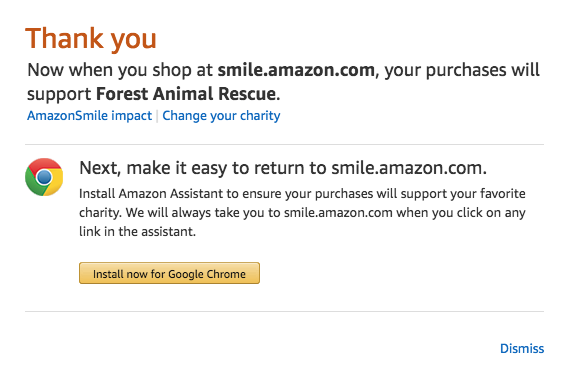 How to support the animals with Amazon Smile – It’s simple! Do you know how easy it is to do your regular online shopping while helping Forest Animal Rescue? This could be one of the easiest ways you can ever help us support the animals – and it’s free! If you shop on Amazon – ANYTIME & EVERY TIME – .5% of what you spend can be given to the animals – at no cost to you! Click on the “Go to smile.amazon.com” button below and follow the instructions just one time – that’s it! Then, every time you shop Amazon, as long as you remember to log on through www.smile.amazon.com, a portion of your purchases can be donated to the animals automatically. It’s simple! You’ll find all the same products when you log on through www.smile.amazon.com as you do on the regular Amazon site, at the exact same prices. Since it will be your first time, you’ll see a prompt to choose your charity. Type in FOREST ANIMAL RESCUE as the charity you’d like to choose. If you shop from a standard Amazon link, the prices will be the same but Amazon will not donate. And follow the instructions to install the extension for your browser. If you forget the next time you log in to www.amazon.com, they’ll even remind you to switch over! NOW, MAKE SURE EVERYONE IN YOUR FAMILY AND ALL OF YOUR FRIENDS DO THIS AND THAT MEANS YOU’VE HELPED IN A REALLY MEANINGFUL WAY, TOO!